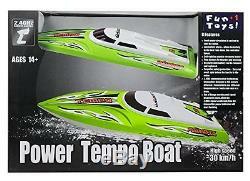 Power Tempo Remote Control Boat - 2.4GHz High Speed Electric RC - UDI002 PRO Version Green. 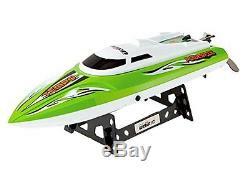 Features: High speed 18 MPH (30 km/h) RC boat is ready-to-run out of the box Super-easy to control: Trigger for throttle (go forward, reverse), Knob for rudder (turn left, right) Trim buttons for left/right/forward/reverse Capsize recovery feature - push throttle & trigger forward then back to self-right the boat 2.4GHz transmitter with automatic code pairing; Control distance: 120-150 meters Waterproof hull with anti-tilt modular design is built from impact-resistant ABS plastic - parts are easily maintained and replaced Water circulates in and out to keep the motor cool at racing speed Low battery alarm - when the battery in the boat runs down to only 1 minute left, the transmitter beeps Special Safety Feature: Propeller will not spin unless the boat is in the water Recharge the boat battery with included USB charger Display stand helps protect propeller and rudder when not in use Ages 14+ Includes: 1 x High Speed RC Boat 1 x 2.4GHz Controller 2 x 7.4v 1500mAh Li-Ion Battery 1 x USB Battery Charging Cable 1 x Display Stand 1 x Spare Propeller 1 x Instruction Manual Specifications: Size: 424x114x119mm Boat Weight: 1 lb (460g) Battery for Boat: Li-Ion 7.4V 1500mAh Battery for Controller: 4 x AA (NOT INCLUDED) Charging time: 90 minutes Running time: 6-8 minutes CAUTION: DO NOT USE IN SALT WATER. You will receive (1) Power Tempo Remote Control Boat. DO NOT USE IN SALT WATER - Race at 18 MPH (30 km/h) and blow other remote control boats out of the water! Do extreme sharp turns and auto flips (self-righting feature lets you keep your boat in play even if it capsizes). Features a water-cooled, single-prop powerful 370-size motor for safe and reliable operation and a rugged ABS anti-tilt hull that combines style, speed and affordability. Low battery alarm warns you when the RC boat is almost out of power so you know when to head for the shore. Safety features to protect the battery and the boat: protects from over-charge and over-discharge of the battery. Includes an extra high power rechargeable 7.4v 1500mAh Li-ion battery to double your racing time! Power Tempo Remote Control Boat - 2.4GHz High Speed Electric RC - UDI002 PRO Version Green Power Tempo Remote Control Boat - 2.4GHz High Speed Electric RC - UDI002 PRO Version Green. BOXES -PLEASE PROVIDE A PHYSICAL ADDRESS. Buyers should check that this item can be used in their. Country as the voltage may be different. We guarantee that your issue will be solved quickly. Thank you for looking on our lists You are welcome to watch other items on our store. The item "Power Tempo Remote Control Boat 2.4GHz High Speed Electric RC UDI002 PRO" is in sale since Saturday, April 16, 2016. This item is in the category "Toys & Hobbies\Radio Control & Control Line\RC Model Vehicles & Kits\Boats & Watercraft". The seller is "sbm1986" and is located in US. This item can be shipped to United States, to Canada, to United Kingdom, DK, RO, SK, BG, CZ, FI, HU, LV, LT, MT, EE, to Australia, GR, PT, CY, SI, to Japan, to China, SE, KR, ID, to Taiwan, ZA, TH, to Belgium, to France, to Hong Kong, to Ireland, to Netherlands, PL, to Spain, to Italy, to Germany, to Austria, RU, IL, to Mexico, to New Zealand, PH, SG, to Switzerland, NO, SA, UA, AE, QA, KW, BH, HR, MY, TR, BR, CL, CO, CR, DO, PA, TT, GT, SV, HN, JM, AG, AW, BZ, DM, GD, KN, LC, MS, TC, BB, BD, BM, BN, BO, EC, EG, GF, GG, GI, GP, IS, JE, JO, KH, KY, LI, LK, LU, MC, MO, MQ, MV, NI, OM, PE, PK, PY, RE.